This home, located at the heart of Ramapuram is very near DLF, L&T, SRM University (Ramapuram Campus), MIOT, Pon Vidyashram, St. Johns, etc. It’s a great home for people working or studying at the Porur/Ramapuram area. 2 BHK, 1040 Sq. Ft.
Up for rental in June 2011 is this beautiful 950 Sq. ft, 2BHK, single family home in Sowmya Nagar, Medavakkam. 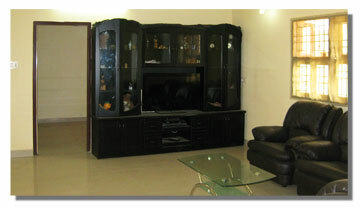 Close to IT companies – Just 3.5km from OMR Sholinganallur junction. Great ground water – No need to rely on corporation water. Well lighted – Corner home with 30ft road access. Breezy home – Excellent cross-ventilation if you leave the front and back door open. Quiet neighborhood – Set about 1/4 km inside from main road. CCP – Covered parking space to park one car and a couple of bikes. Oh, another important point, it comes with great neighbors!